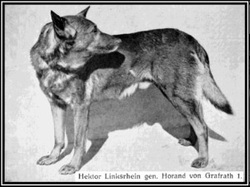 This is a photograph from a White German Shepherd coming from a German newspaper from 1906. The name of this newspaper is unknown, also is the name of the dog. 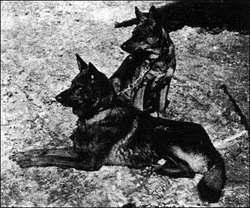 Looking at the date there is a real possibility that the dog may be Russian or Greiffa, one of Greiff's daughters. The only reports from a kennel of White Shepherds before 1900 come from Alsace-Lorraine. 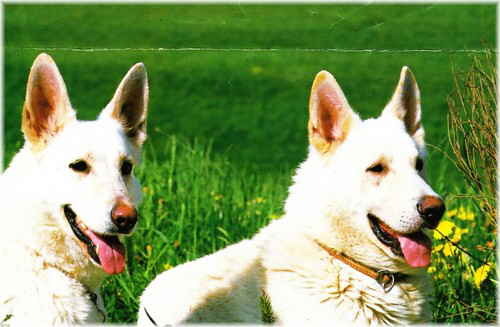 At the Royal Court of the House of Habsburg they were breeding pure breeds of White Shepherds. According to the storys, especially the ladies of the Court were very charmed by the looks and color of these athletic, but gracious white dogs. The more so because they matched perfectly with the marvelous silver-gray of crèmes white Lipizzaner horses which pulled the royal carriage. The aristocratic family von Habsburg where very influential all over Europe and their beautiful dogs were famous. This could have been a reason the English call these dogs White Alsatians. (White dog from Alsace). Some abstention about this story is needed here. 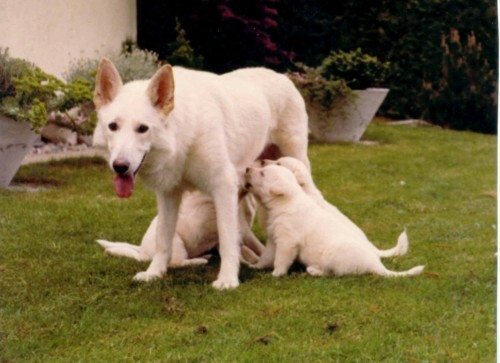 There are rumors and references to the breeding of White Shepherds without any proof about the truth of this story. On the other hand, there are lots of references to the "von Habsburg" bloodlines coming from big and famous Kennels. That makes this story interesting enough to be told. In 1906 the first dog was brought to America. It was Mira von Offingen. However, Mira did not live up to her expectations in America. Turning out to be no match for Queen von Switzerland at the New York Show of 1908 she was sent back to Germany without being registered in the American stud book. "I have owned and trained white and dark German Shepherds for twenty-seven years. The difference lies in the individual animal, not the coat color." "One thing I will not abide is cruelty to animals and in my opinion destruction of a white Shepherd because of its color is criminal." "My 'White Shadow' line has appeared in many motion pictures and have Pasty awards to attest to their intelligence. This line can be traced back to the Habsburg of Austria. 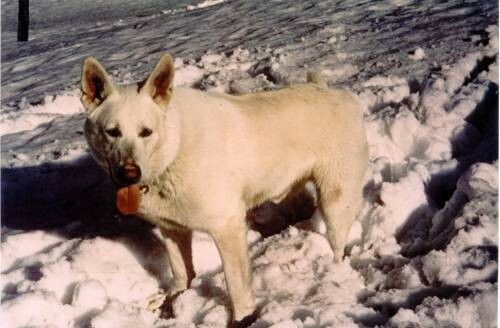 If white Shepherds are supposed to be inferior, shouldn't one have been degenerate after all these years? Well they haven't and they're not!" 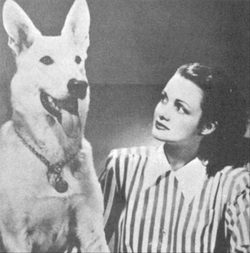 Dorothy Crider, actress, breeder and dog trainer for motion pictures and TV. 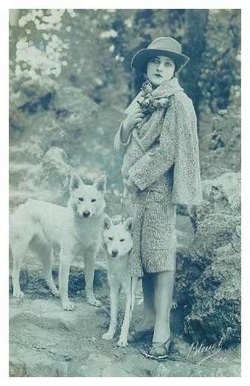 Many enthusiastic boosters of the white Shepherd were once anti-white. Such is the case of Sgt. Bryan Anthony of the London, Ontario Police Department. "I was not aware Prince was white when I came to check the volunteer for the Canine Section. My immediate reaction, the result of twenty years of training and handling police dogs in Britain, was to walk away from a white German Shepherd. But I decided the dog at least deserved a chance. After a great deal of examining I put aside the prejudice of many years. This dog seemed to possess the qualities of intelligence, aggressiveness and strength that are required for police dog training. 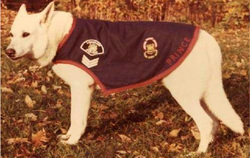 Prince was one of two dogs selected out of sixty, the other being a standard Shepherd."